Trust is sacred to Allen Sydnor. The way he sees it, every lawyer must earn it the old-fashioned way: By always telling the truth and by contributing as a valuable part of society. 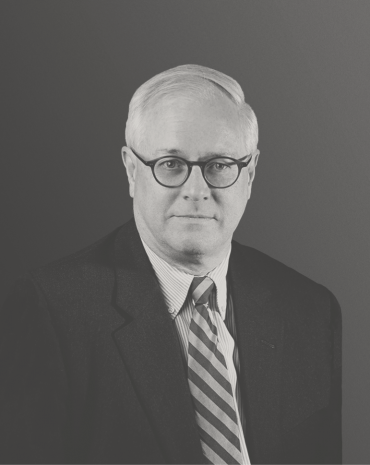 Allen believes that lawyers have the ability, and the responsibility, to influence society. In turn, society has the ability to positively influence lawyers. When attorneys function as a contributing member of a community, they become better attorneys. Arguments are no longer abstract, they have a context. A seasoned Scoutmaster and an active member of his church family, Allen is passionate about community service and making a positive impact on society. For nearly three decades, Allen has specialized in almost every area of healthcare defense. Since joining the firm in 1987, he has tried cases to conclusion in Federal and State courts in several states. Although his practice has focused primarily on the defense of claims against healthcare providers and pharmaceutical and medical device manufacturers, it has also included general insurance, product liability and motor vehicle accident litigation. Allen partners closely with clients and provides them with calm reinforcement in the chaos of litigation. His clients benefit immensely from his ability to remain focused on how to obtain the best possible results by strategically drawing on his vast experience and the collective knowledge of the firm. Allen is also a registered mediator listed on the Alabama State Court Mediator Roster. Allen enjoys his free time with his wife, Marda, and their two sons. A native Virginian, Allen earned his BA from Hampden-Sydney College and his JD from Cumberland School of Law at Samford University. Appellate: On August 12, 2016, the Alabama Supreme Court affirmed a summary judgment obtained on behalf of a pharmacist and pharmacy in a wrongful death case pending in Cullman County Circuit Court. In Richard M. Kemmer, Jr., as administrator of the Estate of Phyllis Knight, deceased v. Alabama CVS Pharmacy, LLC, et al., the Court affirmed without opinion a summary judgment entered by Cullman County Circuit Judge Gregory A. Nicholas. Medical Device Litigation: Summary Judgment was obtained in favor of the manufacturer of a Microwave Delivery device used during a transurethral microwave thermotherapy (TUMT) procedure. The device was a Class III non-surgical device restricted to prescription use that is intended to relieve symptoms and obstructions associated with benign prostatic hyperplasia (BPH). Plaintiff sued the manufacturer and the physician who performed the procedure claiming that he suffered abdominal and bladder pain, dysuria (painful urination) and urinary incontinence as a consequence of the procedure. Summary Judgment grounds included (1) data captured and stored by the device established there was no malfunction during the patient’s procedure; (2) there was no warranty for use of the device on patients for whom the safety and effectiveness had not been determined or on patients not diagnosed with benign prostatic hyperplasia; (3) use contrary to the labeling and instructions constituted unforeseeable product misuse and an intervening and superseding cause that relieved the manufacturer/seller of liability pursuant to Morguson v 3M Co., 857 So.2d 796 (Ala. 2003) and (4) as a Class III prescription medical device it could by definition “present a potential unreasonable risk of illness or injury” and, thus, was not defective or unreasonably dangerous when properly prepared and accompanied by proper directions and warnings under the Alabama Extended Liability Manufacturer’s Doctrine. Medical Device Litigation: Summary Judgment was obtained in favor of the manufacturer of a Class II “external cooling device.” The device is prescribed for use by a patient’s physician and is intended to be used only by sophisticated, trained users. Plaintiff alleged she was burned when the device was used on her knee postoperatively at a Montgomery hospital. The Complaint characterized the incident as a “chemical burn, probably from bleach.” The hospital owned seven (7) of the cooling units but could not identify which one was involved in Plaintiff’s treatment. The Court held that Plaintiff did not have a breach of warranty cause of action and that the learned intermediary doctrine barred Plaintiff’s claims. It noted there was no allegation that Plaintiff sustained a thermal injury and that the subject unit was a cooling device that did not have the capacity to heat water to a temperature that would burn human skin. Because the manual established that only distilled water should be used, use of other liquids constituted a misuse or unintended use of the device barring any liability under the Alabama Extended Liability Manufacturer’s Doctrine. It was undisputed that use of the device with “distilled water only” would not cause a “chemical burn” and distilled water does not have the odor of bleach. Medical Device Litigation: A favorable settlement was obtained during mediation of a personal injury/wrongful death action involving burns sustained during the use of a 16-year-old hypo-hyperthermia device. The device had three high temperature safety devices and three low temperature safety devices as well as displays and alarms. The manuals and labeling made it clear that the device was intended to be used only by trained healthcare providers who had read the Operation Manual and had a thorough understanding of the device. Preventive Maintenance procedures were to be performed on a quarterly basis including testing of the high temperature safety devices. The manual cautioned “Use distilled/sterile water only. Failure to use distilled/sterile water may result in poor performance and damage.” It was established that (1) treating nurses never read the manuals and had not been trained; (2) patient was left unmonitored for longer than the recommended times; (3) there was significant corrosion on the key components of the high temperature safety devices; and (4) the recommended Preventive Maintenance had not been performed. Defense experts included a metallurgist who examined the corrosion to establish poor maintenance and the existence of high levels of chlorine which meant tap water rather than saline/distilled water had been used, design engineers who established conformance with accepted designs and a hospital clinical engineering expert who established the practices that would be reasonable for a manufacturer to expect to be in place. In 2016, presented the District Award of Merit, Unit Award of Merit and Scoutmaster’s Key at the Boy Scouts of America Vulcan District Annual Awards banquet.